Most of us have memories of being told to “sit up straight!” and “stop slouching!” as a child, though few children pay attention to these reminders or to maintaining good posture. However, starting the habit of good posture early on can pay dividends for health and wellness over one’s lifetime. Sitting, standing, lying, and walking with your spine in the correct alignment is important for your health for several reasons, yet so few of us are conscious of our posture as we navigate our daily lives. Let’s review the importance of establishing and maintaining good postural habits, the impact of good and bad posture on your body, and how to improve and maintain the habit of good posture in your life. 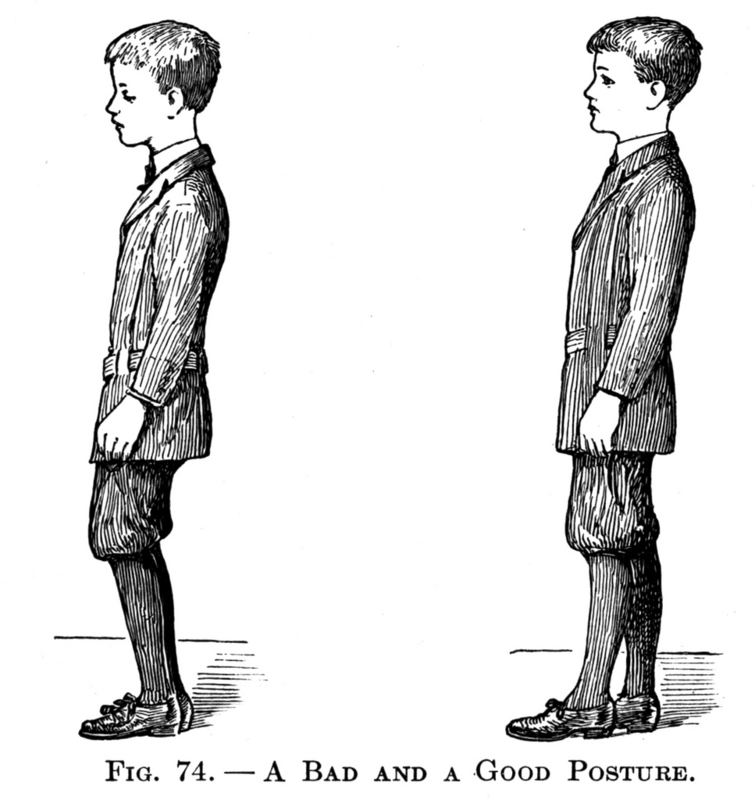 When thinking about good posture, many people think of standing up straight like an iron rail. However, this is inaccurate, and could even cause you injury in the long term. In a standing position, one trick you can use to maintain excellent posture is to pretend that a balloon is tied to the top of your head and is slowly pulling your head and spine in an upwards direction. Your knees should remain slightly bent, which is easier on your hips. While standing, your back should stay in the same line, with a gentle inward curve at your lower to mid-back. You can use the muscles of your trunk and core to keep your back in alignment. To further improve your standing posture, wear appropriate, comfortable footwear. Avoid standing in one position for more than 10 minutes at a time and try to shift your weight around from one foot to another as you do so. Proper sitting posture includes feet that are flat on the floor and a head that is facing straight forward. You may need to place a support under your feet or to boost your computer screen to accomplish this. While sitting, keep your shoulders held back and use your core to keep your ribs in a position where they are not popping out and away from the body. Posture while lying or sleeping is something few people consider. For ideal alignment of the back while sleeping, sleep on a firmer mattress that will provide support to the vertebrae and try to sleep on your side with a pillow under your knees if you can tolerate it. Avoid sleeping on your front or using more than two pillows for your head. While good posture makes it easier for your body to function, poor posture results in a litany of health woes. Maintaining excellent posture allows for support for the back and the organs of the abdomen. This means optimal blood flow and supply of nutrients and oxygen to all your body’s tissues. Good posture improves circulation of blood in the body, which has countless benefits for overall health. Poor posture also results in both acute and chronic pain to the back, legs, and other areas of the body. Sitting in improper alignment can hurt and can cause damage to the muscles and nerves that may be permanent if posture is not improved. Bad posture can cause herniated discs and nerve pain, which worsens pre-existing back conditions. Similarly, consistent improvements in posture can relieve chronic pain that has existed for years on end, especially back and neck pain. Poor posture has also been found to be related to chronic fatigue. If you are always tired or exhausted from activities you would not normally find to be excessively taxing, it may be time to pay attention to your posture in daily activities. One technique you can use to improve your posture is to set alarms on your phone to remind you to check your posture and make adjustments periodically. There are also apps that provide similar functionality. Strengthening your core muscles is among the most important ways you can improve your posture on a more permanent basis. The stronger your core, the easier it is to hold yourself up and keep your bones and organs supported. Talk to your chiropractor about how you can maintain or improve core strength. There are also many helpful online resources available on this topic. For improving the strength of your core as well as creating flexibility, yoga and Pilates can be very helpful in improving your posture as well as increasing your awareness of what good posture feels like. Using these tips, you can monitor your posture and make corrections in how you are sitting, standing, or lying when needed. By regularly monitoring your posture and making changes, you are improving your spinal and musculoskeletal health and ensuring your physical wellness and comfort for years to come.